Blackberry messenger, texting, emails, Skype, ichat ... there are so many ways to communicate with the people around you. Still, nothing compares to opening your mailbox and discovering a letter. It's especially nice to receive a letter for no reason at all, it's not your Birthday or a special Holiday. A personalized letter always leaves a great impression. Yesterday I spent some time in a stationery store and realized how much I miss sending and receiving mail. I stopped by Etsy.com to check out some great stationary. Here are my top picks! 15 comments on "write it all down"
I agree a handwritten letter is so more personal and thoughtful. I agree with you 100 percent on that. Being able to recieve a letter from a friend in the mail is so exciting. 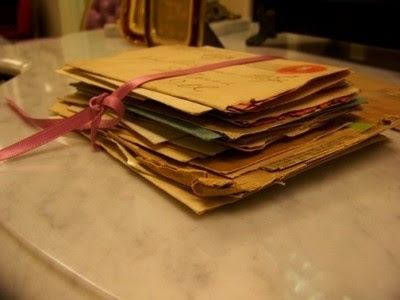 I love handwritten letters, I've got shoe boxes of them that I've kept since I was a kid. They put a huge smile on my face when I go over them. There is nothing like reading my mum's handwriting especially since she died. handwritten letters are so personal. i really wish it was more prevalent today. but i like to surprise friends and family with a little note every now and again... it makes them feel special. I agree! letter writing is so much more meaningful and deep then the quick fix of technology these days. I love this post. I think hand written Thank You notes are still very important. I always send them after someone invites me to a dinner party, gives me a gift or simply does something nice. Someone told me to always have nice stationary on hand b/c you never know when you are going to need it. I have never forgot that!! I love getting written mail! It adds a personal touch..
Oh I know! I miss having a pen pal!